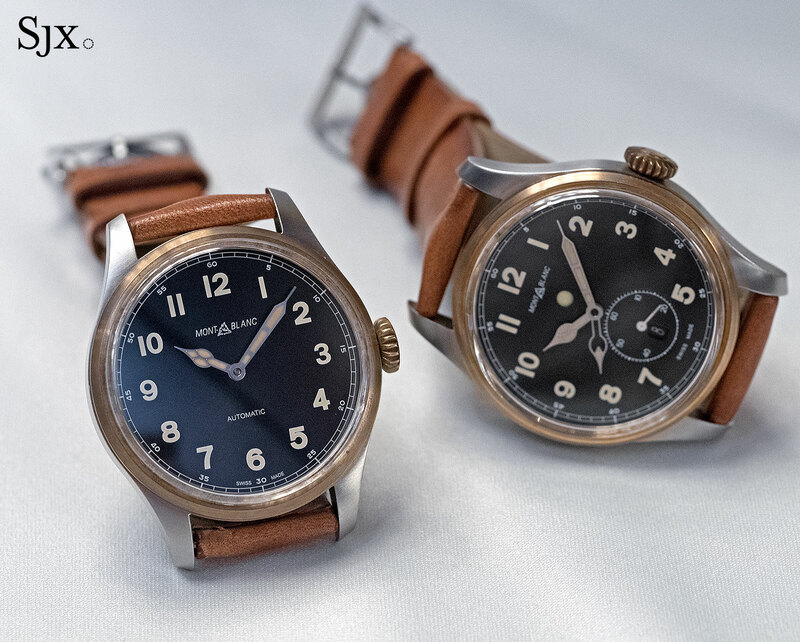 Montblanc's 1930s aviator-style watches get a bronze facelift. 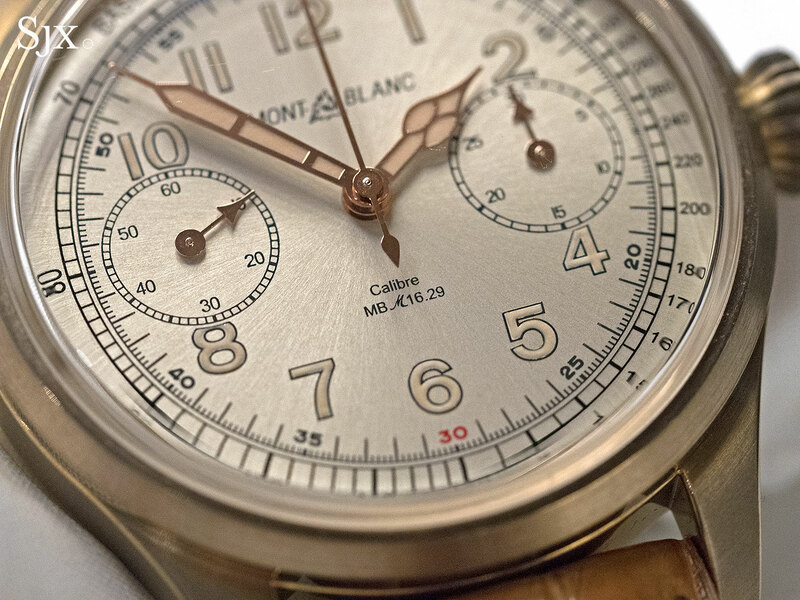 The copper alloy’s run as the metal du jour continues with Montblanc slated to unveil three 1858 Collection wristwatches in bronze at SIHH 2017 next month, including the 1858 Chronograph Tachymeter in bronze (pictured above). Modelled on pilot’s wristwatches of the 1930s, the 1858 Collection is characterised by large Arabic numerals and cathedral-style hands – the exact same design was used previously on the stainless steel versions of the 1858 launched earlier in 2016. Montblanc relies mix of copper and aluminium for the bronze used in its watches, the very same alloy used by Tudor in its Black Bay Bronze. Instead of the untidy greenish patina that forms with ordinary bronze, the aluminium bronze alloy develops a more even bronze oxidisation on its surface. 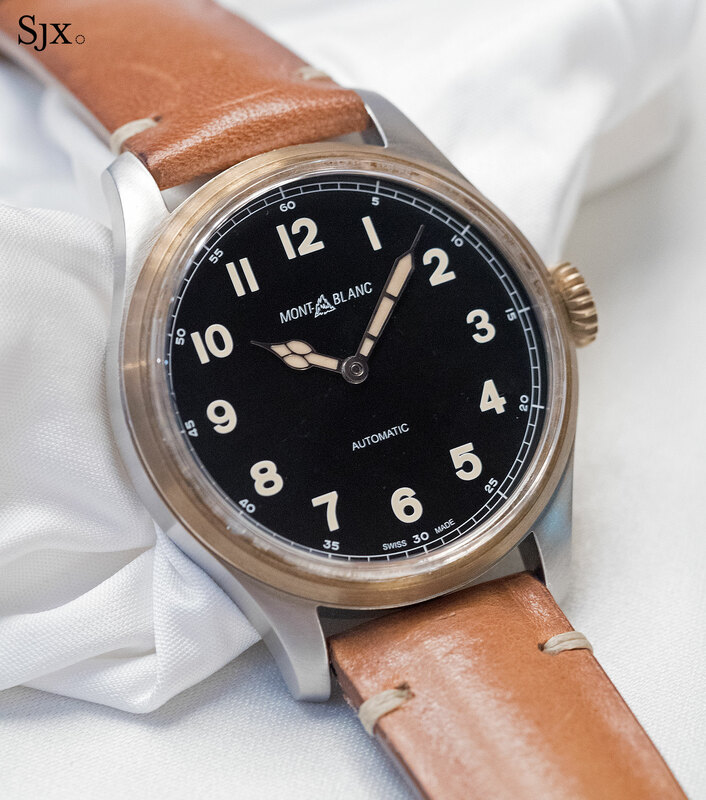 To match the patina of the case, the Super-Luminova on the dial and hands is beige to mimic the look of aged radium found on vintage watch dials. All three additions to the 1858 line continue watch division chief Davide Cerrato‘s strategy of building a line of vintage-inspired sports watches – he is careful to point out they are not mere duplicates of vintage timepieces – that will be joined by a line of modern sports watches at SIHH 2017. 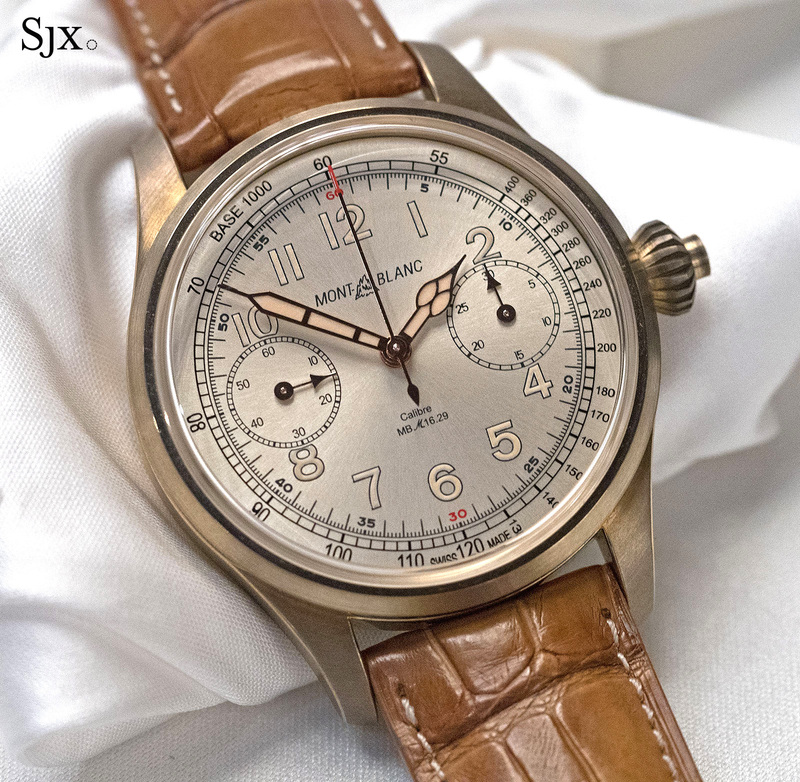 The top of the line bronze model is the 1858 Chronograph Tachymeter Limited Edition. Limited to 100 pieces, the 1858 chronograph has a large 44mm case in brushed bronze, with a bronze-coloured titanium back. The case backs of bronze watches are inevitably titanium or steel since the bronze can cause a skin rash. To match the case colour the dial is a pale champagne with a sun ray brushed finish, a shade inspired by the faded dials on vintage watches according to Mr Cerrato. With the exception of red accents at the quarters, the watch is almost monochromatic; visually striking despite being a pale colour. 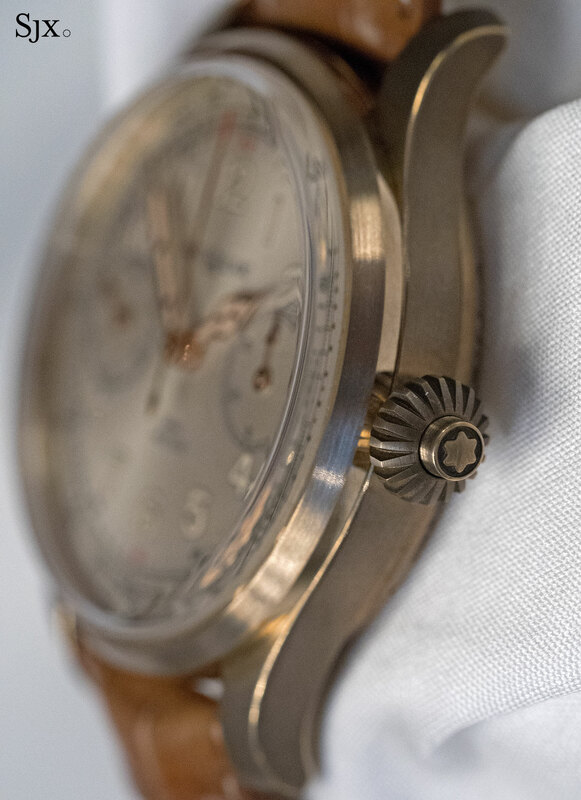 It’s a single-button chronograph, with the pusher for the stopwatch co-axial with the onion crown. To complete the retro look, the sapphire crystal is domed so as to mimic the domed Plexiglas found on vintage watches. 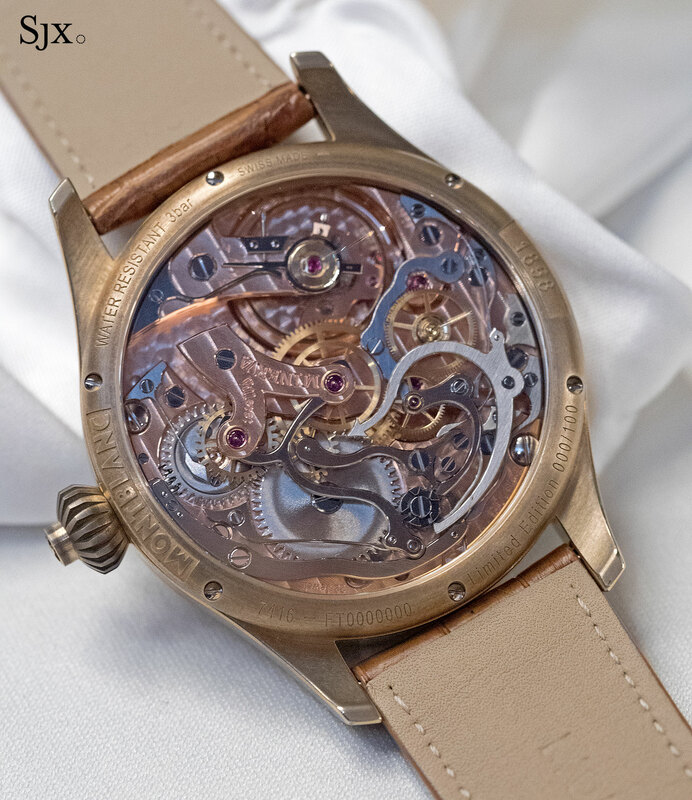 Unusually the MB M16.29 movement inside has its bridges and base plate plated in red gold, instead of the typical rhodium plating found in most Montblanc Minerva movements, again an aesthetic inspired by watches of the 1930s. Based on a pocket watch movement of the 1930s, the calibre MB M16.29 is hand-wound, large in size and classically styled, with the top notch finishing characteristic of Minerva, the watchmaker Montblanc acquired in 2008. The other two watches in the line-up are two-tone: stainless steel cases matched with bezels and crowns in bronze. 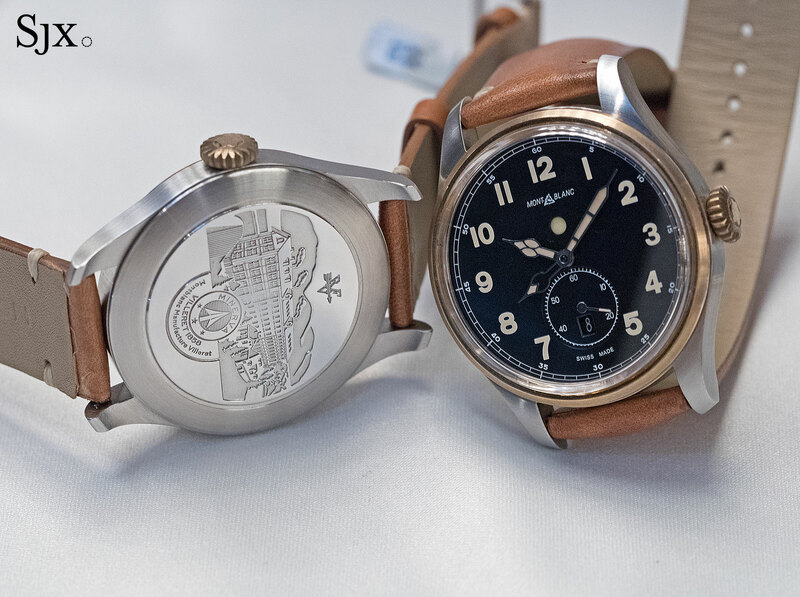 Both are 44mm in diameter, with solid steel backs featuring a relief of the Minerva factory in Villeret. The pair are styled in the same manner as the chronograph, with large Arabic numerals and cathedral hands. But hands on the automatic models are exactly the same as those used on the chronograph, despite neither having a scale to occupy the space on the edge of the dial. That leaves the minute hand slightly short of the railway minute track. The entry-level model is the 1858 Automatic, a clean design with only hours and minutes. It’s equipped with the calibre MB 24.16, which is actually a Sellita SW200, a robust and low cost self-winding movement. 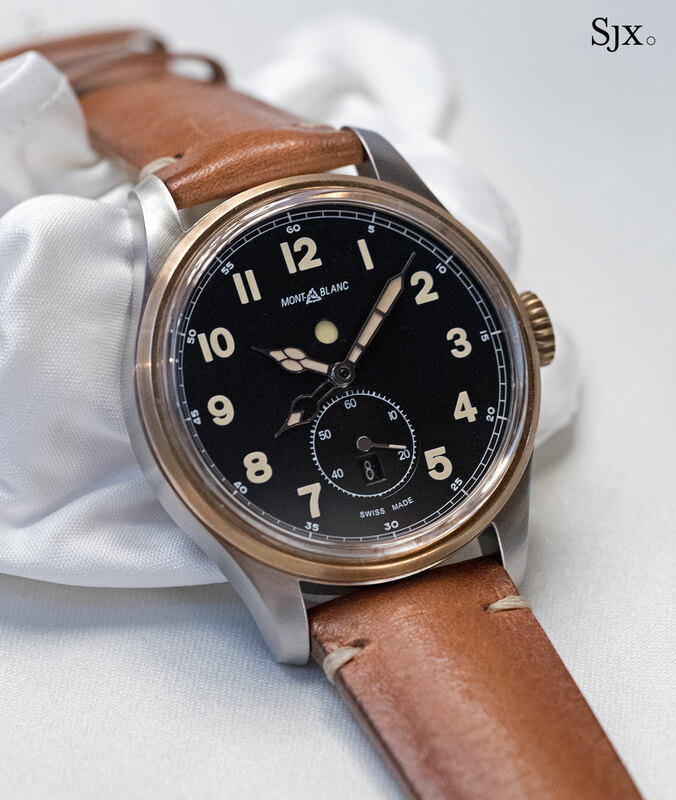 Identical in size and featuring the same base movement, but with the addition of a second time zone module made by Montblanc, the 1858 Dual Time features an additional hour hand to show a second time zone, as well as a day and night indicator located just under 12 o’clock. Being the same size, extra hour hand can be hidden under the main hand when not in use. This also shows the date, which is linked to the local time display and can be set backwards and forwards as the wearer crosses time zones. Because the movement inside is the smallish Sellita SW200, the date window sits close to the centre of the dial, rather than on the edge where it should be. Nonetheless the quibbles are minor given the appealing design and affordable pricing of both 1858 automatics. Available starting April 2017, the 1858 Chronograph Tachymeter Limited Edition (ref. 116243) is priced at €27,500. The 1858 Dual Time (ref. 116479) is €4,990, while the 1858 Automatic (ref. 116241) €3,490. These will be available beginning July 2017. All three will be available from Montblanc boutiques and retailers. Sixteen new old stock Valjoux 23 movements were discovered in Patek Philippe's storerooms and will be put into stainless steel cases.